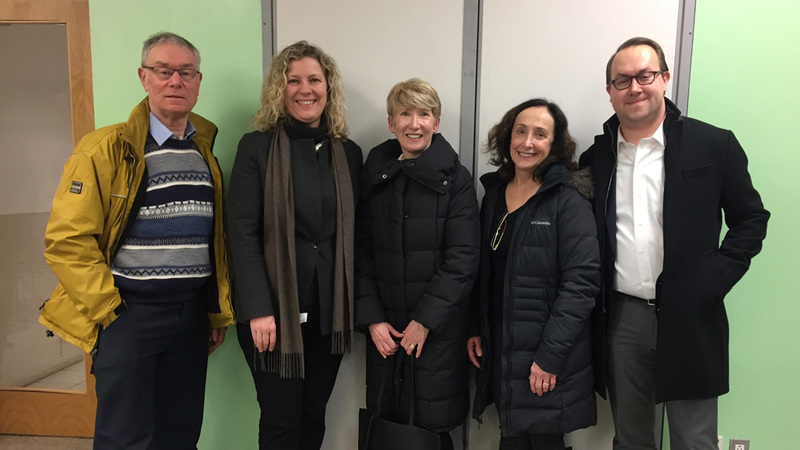 Members meet with Councillor Jaye Robinson. L-r: Geoff Kettel, Councillor Robinson, Holly Reid, Kris Langille and Jason Ash. 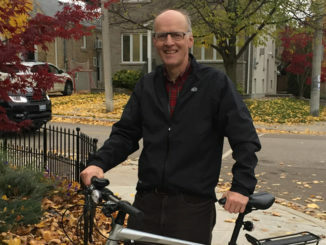 When the ward boundaries were redrawn in advance of the municipal election, it was a good-news, bad-news story for Cycle 26, Cycle Toronto’s advocacy group for the old Ward 26. The good news was that as part of Ward 15 – Don Valley West – we would be gaining allies from the north, the previous Ward 25. 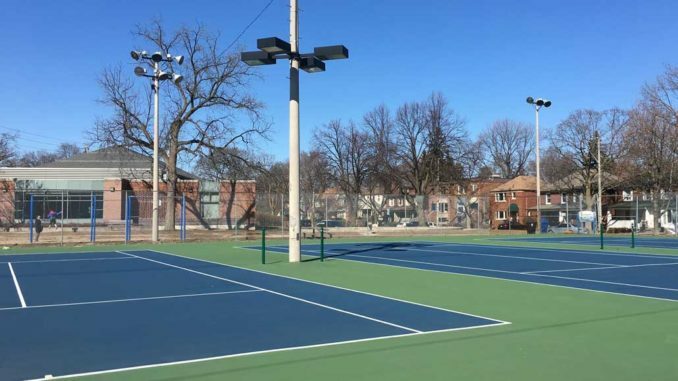 Now for the bad news – we would be losing long-time collaborators from Flemingdon Park to the new Ward 16, Don Valley East. So rather than break up, we decided to join up with safe cycling advocates from Don Valley East and West to form a new, larger group called Cycle Don Valley Midtown. Two meetings have been held so far with a great turnout of people interested in making cycling safer in their communities. Leaside was well represented by Mary Chong, Geoff Kettel, Kris Langille and me. 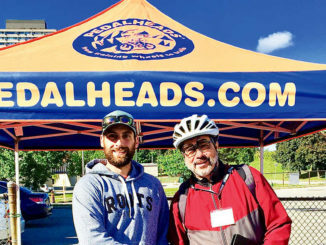 A key goal is to expand our roster of cycling advocates with representatives from all areas of both wards, a territory that extends from Yonge Street in the west to Victoria Park Avenue in the east, north to the 401 and south to the Don Valley. In addition to seeing an acceleration of the implementation of the City’s Cycling Network Plan, and completion of major corridor studies, Cycle Don Valley Midtown will actively advocate for the funding and implementation of cycling infrastructure promised through the Eglinton Connects and Eglinton East projects. Members have already met with BikeShare to work on expanding the bike-sharing service north and east to offer more connections with transit. Within neighbourhoods, Cycle Don Valley Midtown is looking at where we need safe connections of cycling routes, and ways to make cycling safer, especially around schools and parks. Traffic calming is really about safe travel for all road users. 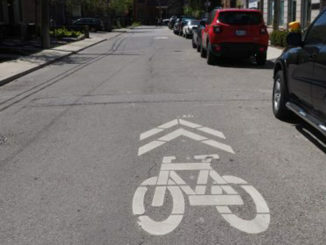 Cycle Don Valley Midtown has submitted a response to the LPOA’s Leaside Traffic Calming Plan showing how cycling infrastructure, such as sharrows and bike lanes, along with on-street parking, can be an inexpensive means of lowering speeds and discouraging neighbourhood flow-through. The group looks forward to working with the LPOA on ways cycling can be part of the solution. The backbone of cycling in Wards 15 and 16 is the well-loved and well-travelled Don Valley Trail system. Cycle Don Valley Midtown members will be providing input on some of the exciting improvements to the trail system currently proposed. These include connecting The Meadoway (Gatineau Hydro Corridor) to the Lower Don Trail, creating a cycling route from the Rouge National Urban Park to downtown Toronto, and the Don Mills Crossing project, which will link up the various multi-use paths near Don Mills Road, Leslie Street and Eglinton Avenue for safe and connected north/south and east/west travel by bike. Interested in getting involved? Join us at our next meeting. See https://leasidelife.com/whatson/ for our meeting listings. Holly Reid is a recreational road rider and cycling commuter. An advocate for safe cycling, she is a member of Cycle15, Cycle Toronto’s advocacy group for Ward 15.